No one is going to claim Android updates are perfect, but Google isn't hiding anything. 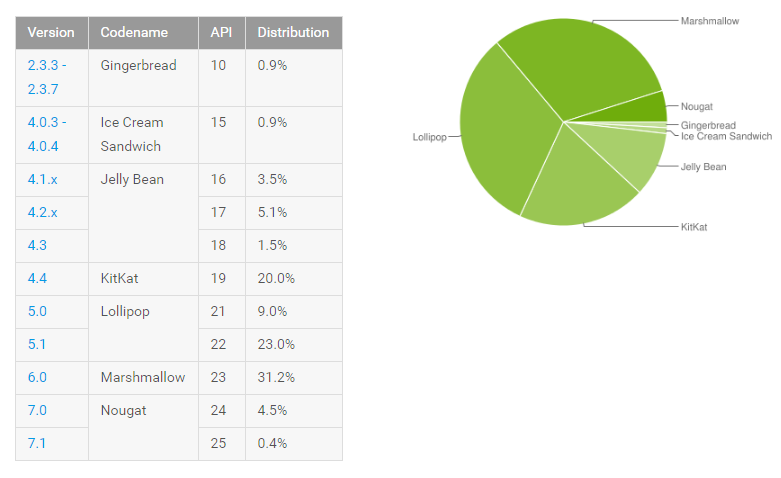 As it does most months, it has just updated the developer dashboard with new platform distribution numbers. Nougat is still just picking up steam, but it had another solid month of growth. The combined share of 7.0 and 7.1 is at nearly 5%. I know that doesn't sound impressive, but it's not bad historically. Here's an updated chart showing the month-to-month changes. So, almost everything is down or flat, with the exception of 7.0 Nougat. Combined, Nougat is sitting at 4.9% of active devices. That's a 2.1% gain over last month, higher than the 1.6% gain we had that time. It's a little strange that Android 7.1 is flat, though. Nougat is still outpacing Marshmallow's rollout, which had hit 4.6% by this time last year. If this trend holds up, Nougat should be running on around a third of devices in a year. This month also marks the first time Marshmallow has declined. It's only down 0.1% this month, but it shows we've turned the corner on Marshmallow. It's all about Nougat now.